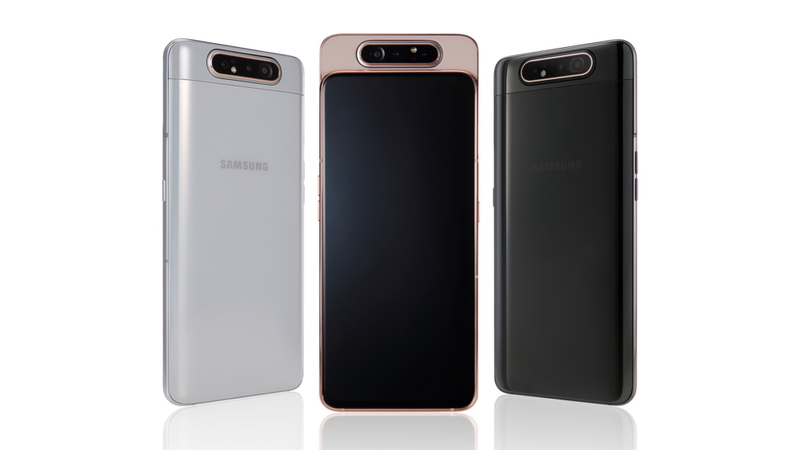 At an event in Thailand, Samsung has announced Galaxy A80 smartphone with rotating camera, in-display fingerprint sensor and which runs on the latest Snapdragon 730G processor. This is the first smartphone from the house of Samsung to come with rotating module. This phone is armed with 48MP rear cameras with LED flash with f/2.0 aperture, 8MP ultra-wide angle camera with f/2.2 aperture and 3D Depth camera which offers Live Focus videos by scanning objects for measurement and depth. When users select the selfie mode in the camera app, the three rear cameras automatically pop-up from the back of the phone and rotate. This camera mechanism delivers the same triple camera experience with the same high-resolution lens for selfies. The rear camera set-up has many features for capturing perfect videos such as Super Steady video mode for reducing video shake to ensure smooth, pro-level action videos, Scene Optimizer that can recognize and enhance up to 30 scenes and Flaw Detection that automatically identifies glitches before you click. The Galaxy A80 sports a 6.7-inch FHD+ (1080×2400) Super AMOLED, Infinity Display with an aspect ratio of 20:9. It is powered by the latest Octa Core (2.2GHz Dual + 1.8GHz Hexa) Snapdragon 730G processor with Adreno 618 GPU. it comes with 8GB RAM and 128GB of internal storage. This phone is packed with 3700mAh battery with 25W Super Fast Charging. This phone runs on Android 9.0 (Pie) with layer of Samsung One UI. This is Dual SIM supporting phone. 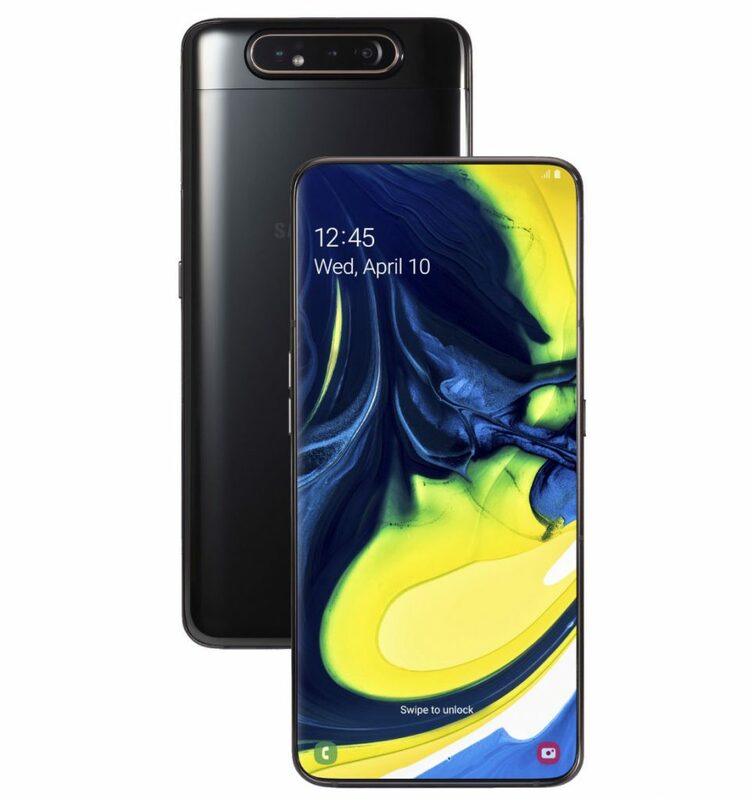 This phone includes button-activated or hands-free Bixby so that users can get connected to the information needed more conveniently. Users can also easily access other features such as Bixby Vision, Bixby Home, and Reminder while on-the-go. The Galaxy A80 also features key Galaxy experiences including Samsung Health, Samsung Pay as stated by Samsung. The Galaxy A80 comes in three colors: Angel Gold, Ghost White and Phantom Black. The Angel Gold color includes elements of pink, while the Ghost White option combines some blue characteristics, so these colors look different depending on light direction and reflection. This phone has 3D Glass + Metal Frame. It is priced Euro 649 ( approximately Rs. 50K) and will start selling in Europe from 28th May. It is expected to be launched in India next month.